Deciding on the right gift for your corporate team, client base or even your in-laws? Why not give the gift of fresh, Wisconsin cheese from Baker Cheese. Nothing says Wisconsin holiday celebrations like all-natural, locally sourced cheese paired with the perfect appetizer platter options. From crackers to summer sausage, cheese spread to curds — we offer a unique combination of choices to help you send a personalized gift box or cheese tray with every attention to detail in mind. Customize your cheese gift box or cheese tray order by size and contents. New in 2016 a commemorative 100th Anniversary holiday cheese box will be available for a limited time to purchase in the Baker Country Cheese Store with orders accepted through December 5th, 2016. This special box includes a 16oz. package of Baker String Cheese, a 16oz. package of Baker Smoked String Cheese, a 10oz. 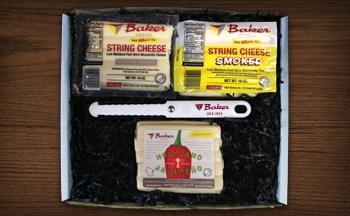 package of Baker Holyland Jalapeno String Cheese and a 100 Year Anniversary cheese slicer. Want to get started on your order now? Our gift boxes and cheese trays are made fresh daily right here in our store and feature Wisconsin-made cheese in a number of flavors and varieties. Stop in the Baker Cheese Country store or call us directly at (920) 477-7111 to learn more about how we can create a custom, personalized gift box or cheese tray for you or your business. Since it opened in 1986, the Baker Cheese Country Store has been a staple in the local community. Featuring more than 100 Wisconsin cheese varieties and locally sourced cheese pairings, like sausage, cheese spread, crackers and cheese curds, the Baker Cheese Country Store is a favorite stop for local residents and annual tourists alike. Baker Cheese is a fourth generation, family-owned, cheese string manufacturer located in St. Cloud, Wisconsin. 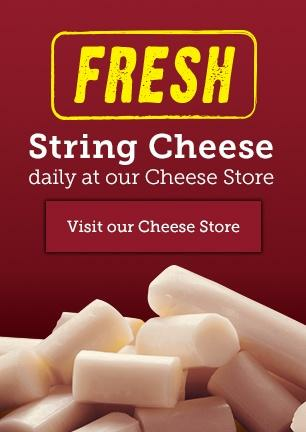 Through generations of innovation, we have maintained the key elements to create truly exceptional, award winning natural string cheese. Baker Cheese is conveniently located off Hwy G, only 15 miles west of Fond Du Lac.